This is absolutely right as far as it goes, but it doesn’t go far enough. At the most fundamental level, the reason it is absurd to suspect the existence of a “cover-up” over the Benghazi attack is that such a cover-up could not have had any conceivable goal. Back to the beginning: the underlying accusation about Benghazi is that the Obama administration deliberately mischaracterised the terrorist attack there as having grown out of a spontaneous demonstration because that would be less politically damaging. Such a cover-up would have made no sense because the attack would not have been less politically damaging had it grown out of a spontaneous demonstration. 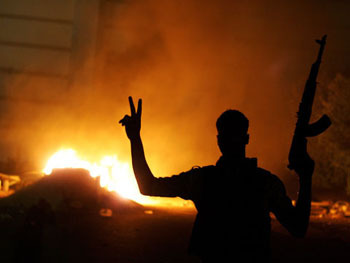 The attack on the Benghazi compound would not have been any less politically difficult for the administration if it had grown out of a riot, nor would any normal voter have expected it to be less politically damaging, nor would any normal campaign strategist have expected any normal voter to have expected it to be less politically damaging. As best I can tell, the suggestion from the right has been that Obama didn’t want to admit that Benghazi was a terrorist attack because….well, I’m not sure, exactly. Something about how this would blow a hole in his claim to be decimating al-Qaeda via drone attacks. Or maybe it would remove some of the luster from being the killer of Osama bin Laden. Or something. But one way or another, the story is that Obama was deeply afraid of admitting that terrorists are still out there and want to do us harm. This has never made a lick of sense. If anything, the continuing existence of terrorists justifies his drone attacks. And it certainly wouldn’t do him any harm in an election. The American public routinely rallies around a president responding to a terrorist attack. Actually, there’s considerable evidence that on September 15, when Rice taped her appearances, the CIA told her there had been protests in Benghazi earlier in the day. The CIA turned out to be wrong about that, but it simply makes no sense for them to have made this up. If it does anything at all, it only makes their response look worse. This whole thing is a conspiracy theory with no conceivable motive. It’s a wild, scattershot attack hoping to take down someone, somewhere, just to claim a scalp. It’s disgusting.